Three years ago, Cristo Staedler had an apartment, a girlfriend and two dogs. He lost everything as he struggled with drug addiction. 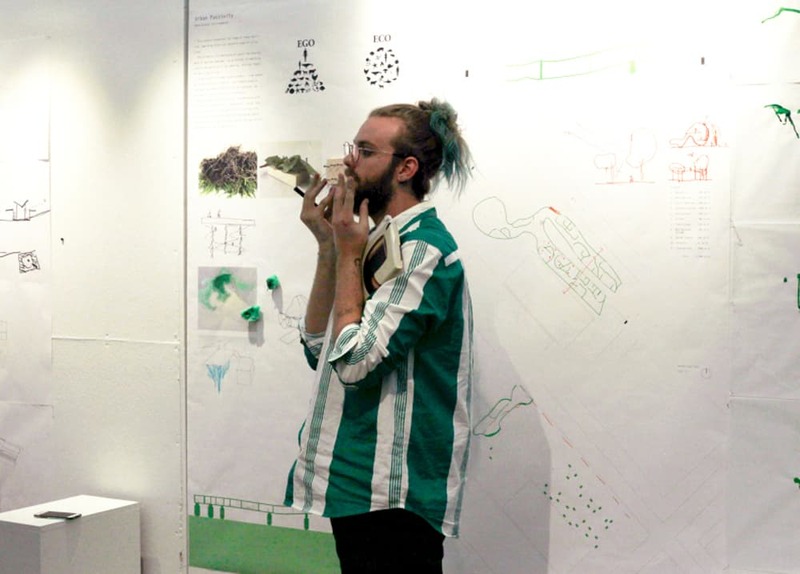 Now he’s a second-year student, enrolled in a class where a project for a homeless project was assigned—a shelter for up to 20 people, covering 15,000 square feet, for an existing site, which happens to be the parking lot across the street from the building where he studies. Staedler’s instructors advised him, “If it’s too personal, take a step back.” He stepped forward instead, sharing his experiences with the class. “I told them it’s gonna be all right,” he says. Students in the class are assigned to reach out and interview homeless people to inform their designs. Staedler felt his personal experience made him uniquely suited to create a relevant design of his own. At a recent review for the resulting projects, in which all of the works-in-progress were pinned to the walls, Staedler explained that when he was living in his car, he was always cruising abandoned industrial areas in which to park. His car windows were broken, making him vulnerable while he slept. In his research, Staedler came across a program called “Safe Parking” in San Diego. He decided to “take that idea to the next level with architecture,” he says. 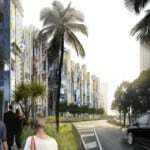 His concept for a 14-unit structure was a cross between a parking garage and a roadside motel, where homeless people could live in their cars, drive directly into a unit, and access private bathroom and bedroom areas. Smith’s project was focused on the 50-plus years old homeless population. She emphasized healthy eating habits and recycling, designing a garden where residents could plant and harvest vegetables while also learning about time management. Smith designed recycling bins for various materials and areas where people could take educational workshops and counseling sessions. Smith says the interview with A.J. lasted eight to 10 minutes. “He understood what we were trying to do,” Smith recalls. It was the first and last time she’d seen him in the neighborhood. Shadi Vakilian, also a third-year student, spoke with a homeless man named Tyrone, whom she encountered collecting bottles that he planned on taking to a recycling center in Bayview. Vakilian’s project focused on a theme she calls “celebrating imperfect,” referring to all of the imperfect fruits and vegetables that ultimately get tossed out when farmers refuse to ship them or grocery shoppers refuse to buy them. She was guided by the Japanese principle of wabi-sabi, an aesthetic based on acceptance of the imperfect. Sameena Sitabkhan, a coordinator and ARH instructor, says the purpose of the class is to take students out of the design studio and get them engaged with the community—to have them collect firsthand narratives and stories about clients and their specific needs. While Sitabkhan acknowledges that past design reviews were usually more formal, with a three-person panel critiquing each project—which left everyone “fried by the end”—the current salon-style discussions are more casual, “making it easier for folks to talk about their projects. 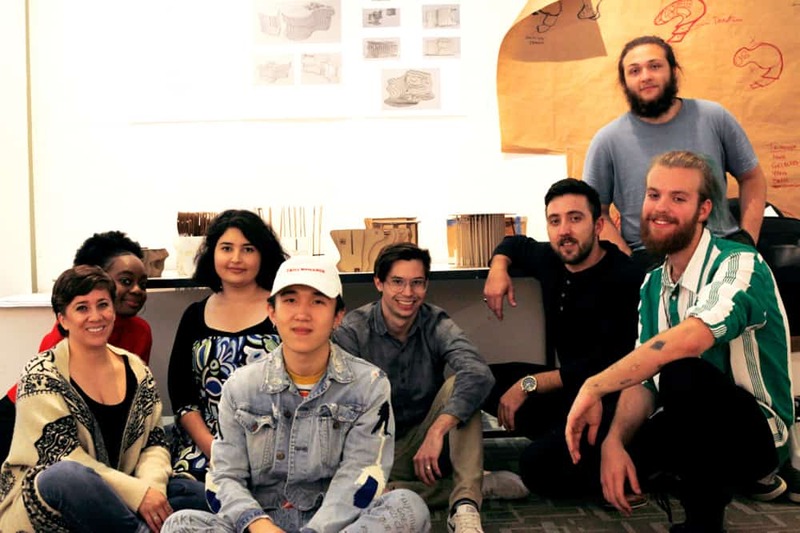 School of Architecture students who worked on housing for the homeless project: (back, L–R) Christina Smith, Annie Mulowayi, Shadi Vakilian, Qiyang Xu, Kyle Lanzer, Mateo Sperry, Cristo Staedler; (front) Artur Festugato Regalin. Photo by Erasmo Guerra.